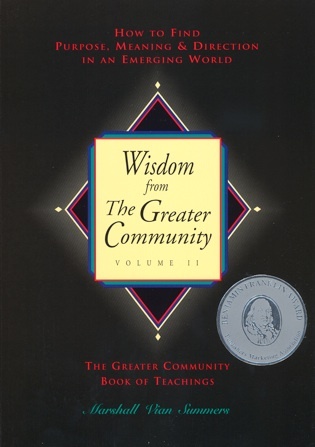 Wisdom from The Greater Community Volume II concentrates on the needs of a world in transition as the greater context for finding your higher purpose in life and resolving personal dilemmas. It speaks of the larger arena of intelligent life called the Greater Community (What is the Greater Community?) and provides the insights and perspective necessary to prepare for a future that will be unlike anything that we have ever known. In the New Message Teaching on topics ranging from “Discernment” and “Greater Community Realities” to “Courage” and “Religion as Mystery,” Wisdom Two opens the way to living a greater life in the world. Both volumes of Wisdom from the Greater Community are a powerful complement to the journey in Steps to Knowledge. Here is presented a series of teachings on The Greater Community Way of Knowledge, which is the inner pathway of spiritual preparation contained within the New Message from God. This is a universal spiritual preparation now being presented to the world for the first time. Wisdom from the Greater Community Volume II is the second book of Volume 5 of The New Message from God.